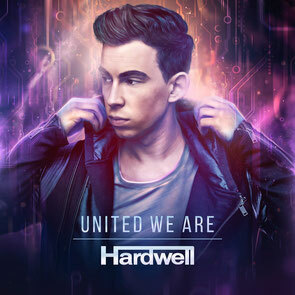 After a year that saw him retain his crown as DJ Magazine’s #1 DJ for a second consecutive year, Hardwell now delivers his debut album ‘United We Are’. Featuring collaborations with both Dutch and international artists, possibly the most notable pairing is with Jason Derulo, which resulted in the song ‘Follow Me’. The album also features tracks with Mr. Probz, Tiësto and singer-songwriter Andreas Moe. Other artists who have contributed to the album include Fatman Scoop, W&W, Bright Lights, Jonathan Mendelsohn, Headhunterz, Funkerman, I-fan and DallasK. Current single ‘Sally’ is the third release from the album and features UK singer/songwriter Harrison in a rockier take on the Dutchman’s trademark sound. With main stage performances at Future Music Festival in Australia to Tomorrowland in Belgium, Hardwell has been working on this debut album release whilst continuing to take his tour, I AM HARDWELL, on a journey of 32 dates across six continents that cumulated with a sold-out show at Madison Square Garden. Additionally, he’s been fronting his own residency in Ibiza at Ushuaïa and releasing tracks such as ‘Dare You’, ‘Everybody Is In The Place’, and his remix of Coldplay’s ‘A Sky Full of Stars’.